The last time the NBA world paid as much attention to the Knicks as it did last night was maybe April 2004, the date of the team's most recent playoff game  and probably not even then. (You can argue that the most recent moment truly in the national spotlight was the Carmelo brawl in December 2006, or maybe Isiah Thomas's pill overdose.) What's most pleasant about the national spotlight is that it wasn't so much focused on the team  which is, of course, playing fantastically  or its players, specifically. It was about us. It was about the basketball world's desperate, enough already desire for Madison Square Garden to be electric again. When MSG is rolling, it reminds you of how great the NBA can be, how much it can mean, in a way that quarter-empty Miami gyms watching LeBron and Wade play footsie never can. People want that, and not just New Yorkers. Last night, oh boy, did we ever get it. The Knicks lost 118–116 to the Celtics last night, but no one will ever consider the game a loss. Paul Pierce's jumper with 0.4 seconds left  a vintage Paul Pierce jumper, the shot he was put on earth to make  seemed like the perfect capper to a wild night in which the teams traded buckets in the fourth quarter to a rather extreme extent. (Often, you didn't have time to cheer a Knicks basket before the Celtics had come down and scored, and vice versa.) Of all the great games Amar'e Stoudemire has played this year, this might have been his best one: In the first quarter, particularly, he looked like vintage Shawn Kemp, only with a better jump shot. The Celtics clearly responded in a way that, as a Knicks fan, made you feel good: with anger and purpose and seriousness. The Knicks haven't inspired any of those three things in opponents in a long time. If the game had ended with Pierce's jumper, it would have merely been a fantastic basketball game, two red-hot teams pushing each other to the limit, encouraging fans and players alike to believe that this Knicks team is relevant again. (We find these discussions of a "rivalry renewed" a bit dull. Besides, the Heat rivalry was always better anyway.) That would have been enough. And then ... Stoudemire's last-second shot. There are three ways to look at Stoudemire's just-a-bit-too-late three-pointer that would have won the game. 1. We got screwed. There should have been more time on the clock, and the Knicks should have won. 2. What was Mike D'Antoni thinking? With 0.4 seconds on the clock, only a tip-in could have worked. He should have brought in Timofey Mozgov and Anthony Randolph, the two tallest Knicks, and just thrown the ball to the basket in hopes of a miracle. Instead, he threw the ball out on the perimeter, essentially guaranteeing there was no way a shot could get off. 3. HOLY CRAP WHO CARES IF THE SHOT WAS LATE DID YOU SEE THAT? That was our take. That is to say: Amar'e's truly amazing pop-and-shot didn't count  never could have counted, really  but it was nevertheless the perfect exclamation point on the night. It's almost better that it didn't count, and even better that D'Antoni called such a doomed play. Had D'Antoni called the Mozgov-Randolph play, it assuredly wouldn't have worked, and it would have been a downer, anticlimactic end to an epic night. 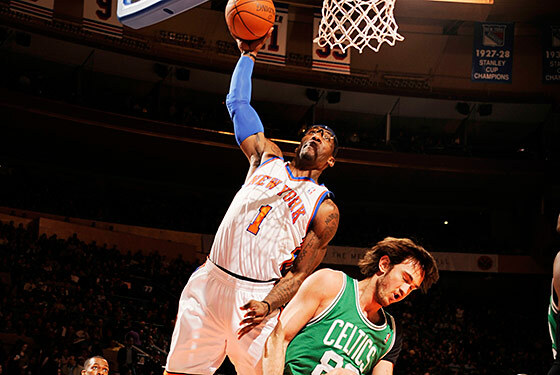 That negated Stoudemire shot, though, that makes the night a classic. That's the underlining of the evening, the Coming Attractions, the perfect way to end a night when the Knicks showed everybody that this is going to keep being so, so fun. The Knicks still have some issues  at this point, D'Antoni is essentially playing a six-man rotation  and a daunting schedule over the next month. But last night confirmed what we already knew: There is something different about this Knicks team.The basketball world is paying attention to New York again, but most important, New York is paying attention to the Knicks again. Hallelujah.